Are you looking to monetize your website with CPM ads? Here is some best CPM ad network for publishers which you can use on your blog to earn more. 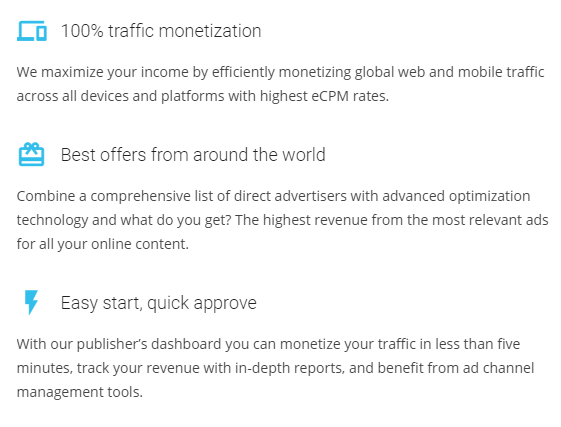 Here in this article, I have compiled and shared the list of some of the best CPM Ad network which publishers like you can join and can earn a decent income. The income from these CPM Advertising networks depends on your traffic and the quality of the traffic you have but be sure you’ll get good. CPM is the cost per thousand impressions and is quite famous in blogging and internet marketing community. It is one of the best ways to earn from your blog and website. CPM Ad network pays you based upon the number of impressions they are getting in the ad served on your website and is calculated simply using the below formula. Here the impression means the number of instances the CPM ad is showing on your blog. CPM Ad network’s ad just need the impression not the click (Like CPC networks do), and so you will not have to worry whether you’re getting a click or not. If you want to make revenue generated from these Best CPM Ad network, then I would suggest you to place these CPM Ads where the user can see it clearly as this will increase the impression and so your earnings well. Looks easy? Yes, it is. But the only drawback CPM ad networks have is the lower payout. You will get $1-$10 per 1000 impression which is comparatively low. So if you are not having good traffic on your blog/website, than these CPM ad networks for publishers may not be the best suit for you. All I can say is, if you’ve 1k traffic a day, you can earn a decent amount. So best upon the above factors, we have shortlisted few best CPM networks for bloggers and have listed here. Join these as per your requirement and as per your website niche. Well, Ezoic is not a CPM ad network but solves the purpose of this detailed article and thought to list here as a solution to many problem. After all, this is all about Best CPM ad networks for bloggers. Why are we looking for best? So that we can get more money from the ad impression…right? YES! And this is where Ezoic helps you and so listing here. Few days I received an email from the team mentioning how they are helping the publishers to earn more from the same website and same traffic. I was impressed a lot after seeing the performance and so thought you people may want to try. Here I am going to write the details about Ezoic based on what I have experienced so far. Ezoic is a service which helps you in way so that your ads can generate maximum possible revenue from your site with the same traffic. Started by Dwayne Lafleur, the former Founder & CEO of the first Facebook advertising network, Cubics, currently, Ezoic is a venture-backed multivariate testing platform that automatically improves a site's layout based on users' actions - on mobile, tablet and desktop. Currently Ezoic technology is used by over 20 Million people every month and this itself tells the story of Ezoic. Now a days we usually heard the term A/B testing or split testing…what it is and why this is being done? Results of A/B testing done on ad spots on your site helps us to find the better performing ad space, and so you can use that space more efficiently. Everybody knows this but how many of us implement. This is where Ezoic helps us. It tests your site by trying different ad spaces on your site and based upon their tool’s result, it will give you the best performing one. There are number of features of Ezoic which helps you to earn more. Here are some of their excellent features of Ezoic which will help you in long run. Recently mobile users have increased a lot, and so if you are a serious business owner, then you must monetize mobile and tablet traffic efficiently. 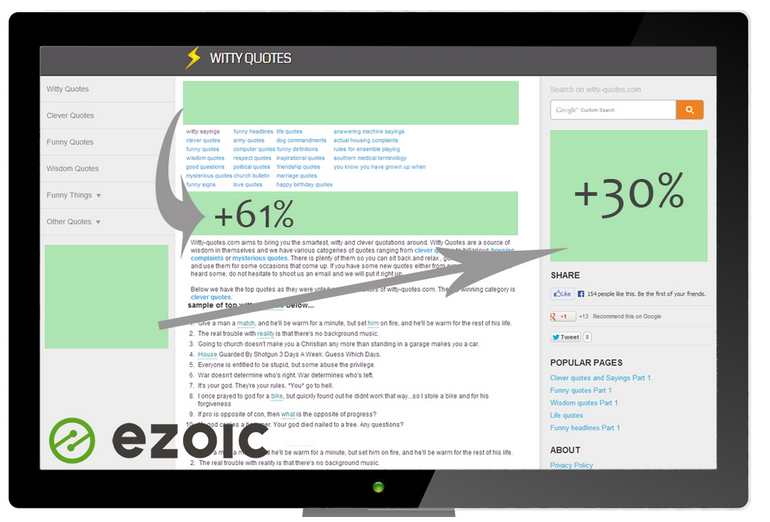 And so Ezoic will automatically create tablet and mobile versions of your site and test layouts on all devices to find the best. It’s true that all the ad position doesn’t perform equally and so finding the best performing space is necessary. This tool will help you to find the best performing layout for you. Color and size affects the earning a lot and so you should focus on these factors as much as possible. It will test the site by placing the ad code in different color, location and size and then with the help of tool, it will analyze all the combination and will suggest you the best and so increase your revenue. You will see a boost of at least 50% in your revenue after joining them. Here are the plans those Ezoic offers. First of all you can try a 30 days free trial and see the effect and after 30 days you can upgrade yourself to any of the below plans. • In the second plan, they will charge depending upon the revenue you are generating from your site. If you are generating up to $2500 per month then they will charge your $49 per month. • 3rd plan is for business or corporate site where they take $19 per month. So, you should definitely try Ezoic, if you are going with CPM ads and aim to earn maximum out of it. Now let's start with few best CPM ad networks for Bloggers. This list has been compiled by our team and worth to try. Also, the serial number on which these are list are just random and doesn't base on any criteria. ANTS doesn’t need any introduction in Vietnam. It is a leading ad network and multi-channel marketing platform of Vietnam and a leader in online advertising space in Vietnam and South-East Asia. Company focuses on technology and works as a SaaS platform for advertising network. ANTS provides a technology platform and works as a marketplace for both advertisers, publishers and 3rd party vendors with a complete range of digital advertising solutions. Started in Sept 1998, by the Q2 of 2014, ANTS started serving 20 Billion ad impression covering the 60% of the Vietnam internet users. You can estimate the popularity and impression that ANTS has in advertising world. ANTS helps you to increase the value of each impression and simplify your operation with the help of their advanced technologies. ANTS pioneered the Private Marketplace, Real-Time Bidding, Re-Targeting and Dynamic Re-Targeting and built technology that made it easy for publishers to identify new opportunities and control how every impression is sold across desktop, mobile and video. 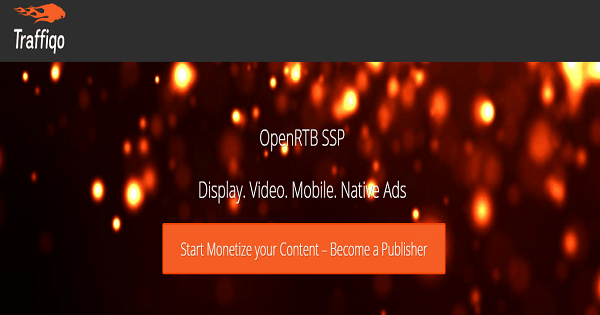 This helps you to maximize ad revenue by optimizing all your revenue channels in one place. It is a SaaS platform that streamlines your ad management functions and allows you to generate even greater advertising margins and capable of scaling to any impression volume. • Improve campaign performance and client satisfaction with detailed and actionable reporting. ADX is the 1st marketplace in Vietnam and includes 300+ publishers running more than 1 billion ad impressions every month. Top advertisers of the industry participate in the auction and provides the maximum value of your ad space. And many more. If you are a publisher and have good hit on your site, ADX is for you. It helps you to do better business by providing the real time analytics and report so that taking decisions and controlling campaigns can become very easy. This tool will give you all the insights of traffic, conversion, and impression. You will come to know about the source of traffic, browsers, location and much more so that you can control and take care of your campaigns. Natural Language Processing & Topic Modeling Engine inside ANTS Analytics solution provides you with Natural Language Processing (NLP) to empower your decision and power users with immediate access to the data they need using every-day language. If you are a video blogger or publisher, this is for you. You can monetize your video with ANTS and this will also get linked with your original ANTS account and you will see earning as combined one. The best thing with ANTS’s video ads are, it support all type of video like VPAID, VAST. You can control your ads like which ads should be shown etc very easily. Ok…many publishers keep on thinking what to do with such huge number of mobile traffic. Here is the solution for that. You can monetize mobile ad spaced with ANTS effectively. Can participate in bid in real time and can get maximum value for it. One thing is sure with ANTS that you will get the best value for your ad space as they have many premium advertisers. Below you can have a look. ANTS is very flexible in payment terms. Their threshold limit is just $10 which is very easily achievable. The payment can be done through various sources like Check, PayPal, Payza, wire transfer, Money Books depending on the country you resides. The best thing I liked about ANTS payment is NET15. Yes, there are hardly few network which allow NET15. That means if you are meeting the threshold limit, you will get paid twice in a month. So, looking at the features and strength of ANTS, it’s really seems to be an amazing network and can be given a try for better value of your traffic and ad spaces. Traffiqo is a real time SSP eCPM optimization platform. Traffiqo help publishers increase their revenues by placing their inventory match to the most relevant advertisers by contextual matching. This is how the eCPM raise automatically. It works as a display platform for inventory optimization and helps publishers a lot. Couple of years ago, Google Analytics announced the addition of an array of new tools, functions and features for e-commerce business. The most notable innovation on the Traffiqo’s side happened the revolutionary approach for marketers to buy traffic by bidding on CPA instead of standard CPC. Traffiqo works on SSP model. SSP is Supply side platform used to sell advertising in an automated fashion. SSPs are most often used by online publishers to help them sell display, video and mobile ads. Traffiqo allow publishers to connect their inventory to multiple ad exchanges, DSPs, and networks at once. And this is turn allow huge number of potential buyer to purchase the ad space so that the publisher can get maximum revenue for that particular space. Traffiqo works on SSP, which has great features for their publishers. They’ve created a simple RTB bidder that can be accessed by using GET requests instead of “classic” OpenRTB format via POST. It can be used for specific implementations, such as mobile applications, or just for simpler implementation with your both banner and native traffic suppliers. Here are some of the other features by Traffiqo which helps you to earn more from the same ad spaces with the help of their tool and platform. Automated Revenue Stats Processing: Traffiqo imports all the data from any other 3rd party platform you are using and thus gathering all in a single platform. This helps you to make business decision faster. Traffiqo API- This API is an awesome feature by Traffiqo where your technical team can connect to the platform. Excellent Support: This is really excellent about Traffiqo. You will get resolution of all the issues and help almost in real time. Their dedicated support team works in way to provide high ROI to their customers. With the service in 196 countries and 20 Billion ads monthly, AdCash is one of the leading CPM ad networks for bloggers. AdCash is a global ad network that that runs on a CPC (Cost per Click), CPM (Cost per Thousand Impression), CPA (Cost per Action), as well as CPL (Cost per Lead) revenue model. Currently, AdCash has a team of 100+ people and 150k+ premium publishers who provide around 10+ Million qualified leads to the advertisers every month. 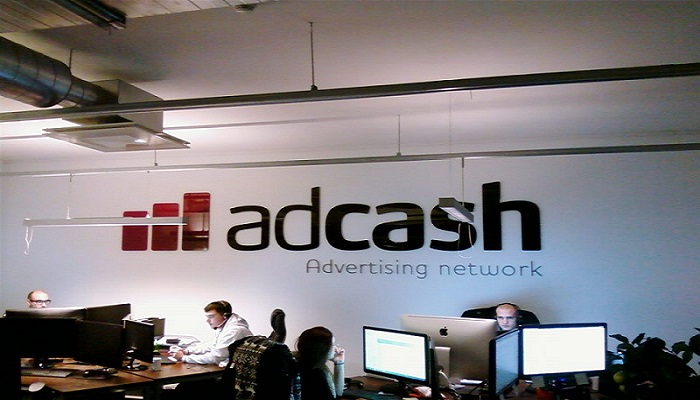 AdCash started their operation in 2007 and very quickly become the leading ad network all across the world. With having the publisher panel in over 8 languages, publishers can manage their accounts very easily. They have 3500+ active campaigns and has also been nominated as “One of the Biggest & Hottest Startup in Estonia” in 2013. AdCash provides wide ranges of ads using which you can engage and converts wisely depending upon the kind of site and its design. You can put this ad in both header and footer and get maximum revenue. As these positions get maximum impressions and so resulting in better earnings. You can find banners of different sizes like 120x600, 160x600, 250x250, 300x250, 336x280, 468x60, and 728x90. You can chose those which suits your site. These banners will be in JPG, GIF, and PNG formats which are considered as best in terms of design and SEO. These ads will show at the background of your site. Like we have site which covers the 960px of width in the center and have left spaces on left and right side. So these ads will accommodate the free spaces. This kind of ad is currently in Beta version but is worth. It will be similar to the YouTube ads and will be shown to the viewer at the start, end and at some particular interval depending on the size of videos. It will be placed at the bottom of mobile app. 8. Site-under – A landing page displayed on full browser size. It will bring the maximum earning to your site as it gets maximum user attention. Serving 20 Billion impressions per month is not a normal cup of tea and lot of hard work and dedication needed for this. The kind of trust that AdCash has gained in this short time span is really recommendable and definitely was not possible without their amazing features and support. 1. They have large number of quality advertisers who are ready to spend great amount to get the qualified leads and so publishers gets high CPC and CPM. Especially if you have traffic from the tier I countries then you can get maximum value of each ad units. 2. They provides dynamic CPM rates and so those ads will be served to you which possess maximum CPM rate followed by others depending on the quality of traffic. 4. Excellent support. You can expect resolution and support 24x7 by their dedicated team. 5. AdCash provides admin panel in 8 different languages and so managing your panel become easy if you are not a native of English. And this list doesn’t end here. There are many more benefits of joining AdCash network. Joining AdCash is very easy. All you have to do is, follow this link and signup as a publisher. Fill the form and enter the required details like your personal information, Payment details etc. and submit the form. Now wait for some time and you will get your account fully verified. Usually you will get verified within 12 hours itself. AdCash works on normal NET 30 payment option. That means you will get paid monthly if you meet the minimum threshold as set by the company. As there are many payment options and so the threshold has been set depending on the payment option you are using for withdrawal as shown below. AdCash is really an awesome CPM ad network for publishers. Easy integration, huge number of advertisers and quick support make it very popular in the CPM ad industry. 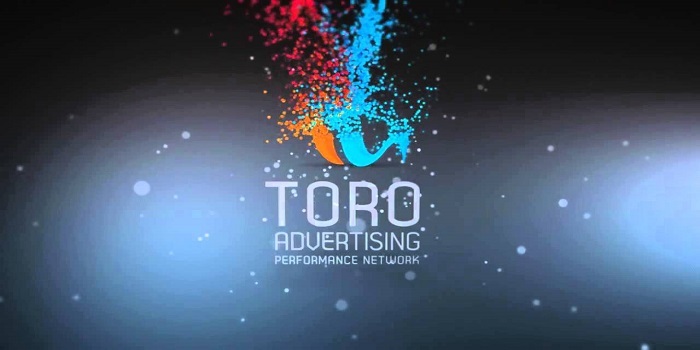 Toro Advertising is a performance based network with over 5 years of experience in serving the ad industry. Having advertisers and publishers from over 90 countries across the geography, Toro Advertising is a leading network who helps you to earn more. They mainly deal with mobile, surveys, education, business opportunity, dating and a lot more types of ads. Toro offers the rich media ads which is the future of ad and marketing industry and have campaigns like CPM, CPC, CPL or CPA. TORO Advertising Ad Network uses HasOffers, EPOM, Mobile App Tracking and AppsFlyer to track the campaigns. If you are targeting the US and Europe markets, then this network can work best for you. But they have bit tough approval process for publishers and affiliates. As they work with some top class advertisers and so ensuring quality is their top focus. So you are new in Affiliate Marketing this is not your Network. But if you are having experience in affiliate marketing then this will work like charm for you. So to get into Toro family you should have 20k-30k unique monthly impressions and a text based content with quality delivery. If you have this, you are good to move with sign up process. Once you have signed up, you can expect to get approved in 24-72 hours, if criteria have been fulfilled. As they only expect quality affiliates and publishers and so the benefits are also of high quality. Below I am going to list few of those. Toro Advertising is very supportive and punctual when it comes to payment. They have a threshold of just $500 which is easy to achieve with the type of site they approve. The best thing I like about this network is the payment system. They offer net 30, net 15, net 7 and even weekly payments, if you are reaching the threshold. But to get weekly payment, you should be at least one month old. That means you will have to get once NET30 payment and later you can request for weekly payment. Payment can be done through PayPal, Payoneer, Bank Wire, ePayments and Skrill. Whenever you want to promote the campaigns and offers, they have the required. They have 1000+ real time campaigns running and you can choose as per your need. High payout is obvious as they work directly with advertisers. Also, as they are only providing quality traffic and leads to advertisers and so you will get much higher payout definitely. They usually provide banner, high rich media, xml feed, video ad, mobile banner, pop-up, and pop-under but if you still need any custom ad of any custom size, you are free to do so. Ask them with the reason and be sure to get that. Being a premium ad network, Toro Advertising is working very hard to main the status and even making it better. Their dedicated customer support team will help you are each and every step. No matter it is simply a query or you need details of payment or anything else, just get in touch and be sure to get resolution. Also, you can reach out to your affiliate manager for custom ad scripts and VIP payment option (in case you are a big publisher). So looking at the features and guidelines, Toro Advertising is really a leading CPM ad network for publishers and you must try them if you are a blogger with quality website or an affiliate marketer with rich experience. YesAdvertising is a trusted name in the field of online and mobile ad networks. They are known for their on-time payment, quality ads with great CPM and quick support. Means they have everything you may need as a publisher. Primarily based in city of Toronto, Canada, YesAdvertising Affiliate Network is a division of YesUp Media Inc. YesUp was founded in 1999 and since then they are working to provide best value for ad space to publishers. With over 100k+ publishers worldwide, YesAdvertising claims to serve over 2 Billion page impression which is quite a remarkable figure. YesAdvertising provides different types of campaigns for publisher viz. CPC, CPM, CPV and CPA and you can run these as per your choice and site. Also, YesAdvertising is not a contextual ad network and so don’t so ads as per your content and instead it shows as per your site quality and geography. Being a reputed name in the Ad industry, YesAdvertising has many features to offer their publishers. Here I am going to list few of those. Unlike many other ad networks, YesAdvertising won’t keep you waited to approve your account for long. You will get instant approval as soon as you will complete the sigh up. No matter from which part of geography you are, you are good to join, if you have a site. • Text banners: Generally the ads comes in 1-2 lines of text. Publishers could use different sizes of banners. • Graphical banners: Graphical banners attract readers easily than others. • Pop-under: Pop-under are the decent creatives to make maximum revenue. The sizes used in Text/Graphical banners are 728×90, 468×60, 125×125, 300×250, 336×280, 180×150, 160×600, 200×110, 300×600, 320x50, 320x100 etc. YesAdvertising works on NET15 payment basis which means you will be paid twice in a month if you are reaching the threshold. The threshold is just $50 and payment will be done through various means like Check, PayPal, Payoneer, Perfect Money and Bank Transfer. For all the CPM ads, publishers mainly keeps on thinking about the CPM rates but you will not have to worry when you are with Yes! You will be getting very competitive CPM rates. This is a unique feature of YesAdvertising which allow you to control the advertisements, to ensure that the ads on their sites are consistent with their brand and enhances the visitor experience. This is another excellent opportunity to earn few extra bucks. If someone is joining through your affiliate links and earn money in Yes network then you will get their 10% as a commission. You can use their banner or write review to get more affiliates. These were some of the major features of YesAdvertising. Another thing that you would like with them is, you can use Yes ads along with Google AdSense easily. eClickZ is a CPM and CPC ad network from USA which provides wide ranges of solutions to their publishers like pay per click, search advertising, and display advertising ad solutions for search, content, display, mobile, video and native ads. eClickZ allows you to monetize your blog, website, or app by displaying advertisements to your visitors in a better way you have done before! • Search & Content Ads- It works on cost per click (CPC) model with their Search XML Feed, Contextual Text Banners, and Private Label Search solutions. • Native Ads- It is a way away from the traditional advertising solution where eClickZ will show ads on your website based upon the content you have. • Banner Ads- Display ads works on CPM model. All you have to do is add their banners on your site and you will be paid for each impression done. Banner ads are available in the below sizes-468x60, 728x90, 120x600, 160x600, 300x250, and more. The minimum threshold is $50 to get the payment but works on NET7. Which means if you are reaching $50 in a week, you can get paid on weekly basis. I hope we all know about Amazon affiliate as they are one of the largest affiliate product networks providing affiliate commission starting from 4%. This rate will get increased with the sale and quality of sale you will make on Amazon. I am also an Amazon Affiliate and currently my affiliate commission rate is 6% which is considered as good share. Ok…that was about Amazon Affiliate. Now let’s talk about our topic Amazon CPM ads. Amazon is making it easier for the web masters and bloggers to make money online. Apart from the affiliate as explained above, you can earn from Amazon CPM ads and here no need to make any sales. Somewhere in Mid-2014, Amazon launched CPM network and in very short span of time, it got good response from the web community. It may be due to the brand name Amazon or can be due to the service Amazon provides or both but the reality is, Amazon CPM ads are quite popular in bloggers. To get started with Amazon CPM ads, first you will have to register with your site/sites and then you can generate the ad code. Here one thing that you should remember is, if you have not added your site and is showing the Amazon CPM ad code then you’ll not get paid for that. One good thing that I liked about Amazon CPM ad is, you are having an option to enter “Target CPM” which means, Amazon will try to show only those ads which will meet your target CPM. For e.g. you have mentioned target CPM as $5 which means you want to earn $5 per 1000 impression. Now Amazon will try to show those ads which can provide $5 per 1k impressions. • You can get higher CPM and fill rate if you will place the ads on the above fold of the site (upper parts). • As said above, CPM ads mainly work on impression which directly refers to page views and so you should focus to increase page views. Have you seen news sites having multiple pages for a single news/slide show? Why so? They are increasing the view to earn more. Currently Amazon CPM is based on the invite only. That means you can join if they will invite you and you can check whether you’ve been invited or not by visiting your affiliate dashboard. If you have been invited then you’ll see the link for the CPM advertising as well. What if you’ve not been invited? Simple thing! Approach them. Shoot an email to Amazon saying you want to join giving your website details with traffic and other stuffs. I am sure if your site is meeting the criteria then they will be happy to add you in their network. Propeller Ads is a great eCPM network with variety of features. They have some strong clients and due to which you can even get $10 CPM as well. It is a UK based company and claims to provide you maximum CPM if your traffic is majorly from Tier 1 countries like US, UK etc. Founded in 2011, currently the network is providing 650+ million daily page views from all the devices. Propeller Ads Media is considered as top CPM Ad network due to many features. Here I am going to list few of their top features which make them one of the best CPM advertising networks. 1. It is open for all. No matter how much traffic you have, you are open to join them. Now definitely the earning will depend on your traffic, quality of traffic and ad placement etc. 2. Easy approval process. Just apply with your site and get approval just in few hours. 3. Net30 to Net 15 payment. Usually Propeller ads works on default NET30 basis but for some campaign it is NET15 as well. 5. Different payment options like PayPal, Payoneer, Wire transfer and a few more. 6. Real time dashboard which allow you to track the stuffs quickly. This is the best type of ad by Propeller from earning prospective as it can give you up to $10 CPM. According to Propeller Ads, entertainment websites (music, movies, photo, downloads, games, viral content, etc.) gets the best CPM for pop-under ads. Here each page view is considered as an impression. And it also works with mobile devices. Having majority of traffic from Mobile? 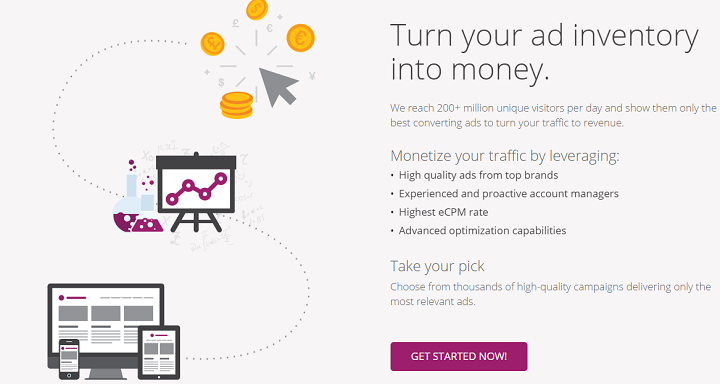 Propeller ads provide you the super method to monetize your visitors. There is couple of types of mobile ads- Mobile Dialog Ads and Mobile Interstitial Ads (apart from the regular mobile banner ads). Layer ads are similar to banner ad itself. You can choose any of the available banner ad units but a bigger ad unit such as 800×600 or 800×440 is recommended. 4. Slider Ads – It’s again a kind of banner ad which fades around bottom of the web page upon loading. 5. Direct Ads- This is unique with Propeller media. Here publishers are given a URL which you can promote where you want on your site like 404 pages etc. 6. Video Ads- If you are also in video blogging than this is for you. Propeller Ads offers three video ad spots: Pre-Roll, Mid-Roll, Post-Roll, and Pre-Game. Another best thing that I liked about Propeller Media is the payment ratio. It is 80:20. That means they share 80% of the revenue with the publishers. Exponential was known as Tribal Fusion in early days. 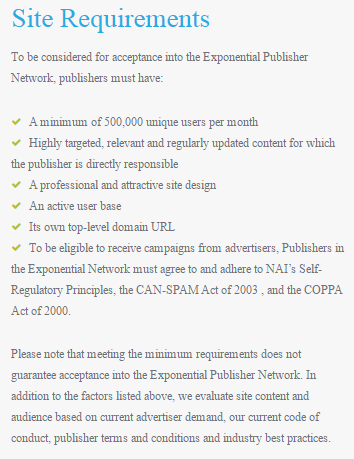 Exponential is a premium CPM Ad network and only approves the site having 500,000 unique users per month and so also known as CPM ad network for high traffic. They are very strict when it comes to site approval but serve quality ads and premium CPM value. They offer high impact ads such as Rising Star ad formats, pre-roll ads. They offer 55% revenue to their publishers. Here are the metrics that they look for before approving any site in their CPM advertising ad network. If you and your site follow the above requirements then you’re good to go. If you are approved by Exponential than be sure to get some good revenue. They’ve simple rule. Only select the quality site and get premium customers (advertisers) and have both advertisers and publishers make good amount. Finally this long post of best CPM ad network for publishers for around 6000 words come to end. I know this was a long topic but worth as this is directly related to the money you are going to make from your website. You should choose that CPM ad network which suits you better. Check your niche, traffic and your audience before selecting the CPM ad network publishers. One thing is sure with these CPM ad network is all are trustworthy and will pay your on time with great customer support. So which CPM ad network you are using for your site? Or are you planning to join any CPM ad network?